Early Bird Opening: 8 a.m. every Thursday from December to March. Visiting this wonderful botanical garden is a real treat! And enjoying a delicious lunch at their cute restaurant Hacienda del Oro affords visitors a panoramic view of the gardens and the sparkling Rio los Horcones. 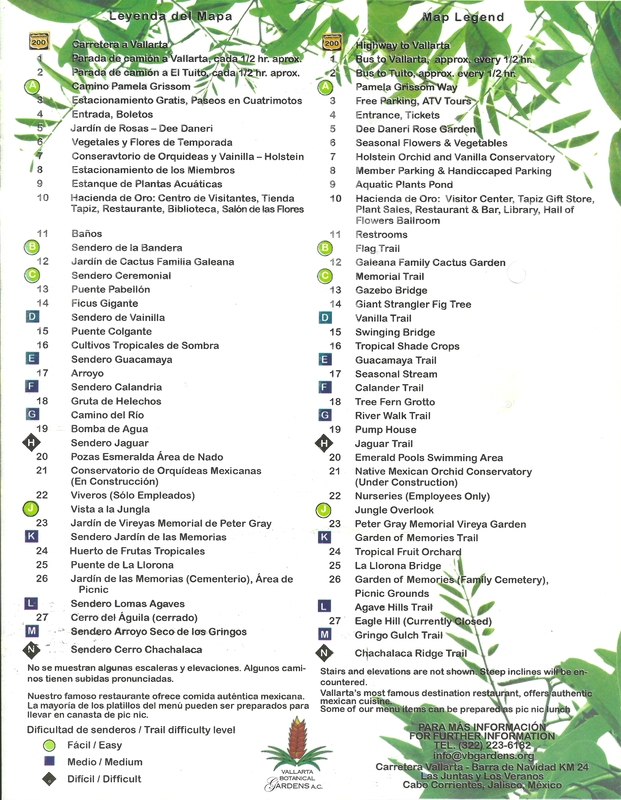 The Vallarta Botanical Gardens are located at the Km. 24 marker of Highway 200 (Carretera Puerto Vallarta a Barra de Navidad), the only road that goes south from Puerto Vallarta. The drive to the Gardens takes approximately 30 minutes from Old Town Puerto Vallarta. Taking a public bus from the Romantic Zone (Old Town PV / South Side): Catch the bus to “El Tuito” at the corner of Carranza and Aguacate streets in the Romantic Zone. This bus leaves every half hour or so. This bus will also return you to Puerto Valllarta. Bus fare is 20 pesos (about 1.50 USD) each way. Be sure to bring bug spray with you, or buy a small container of bug spray at the entrance to the Botanical Gardens. 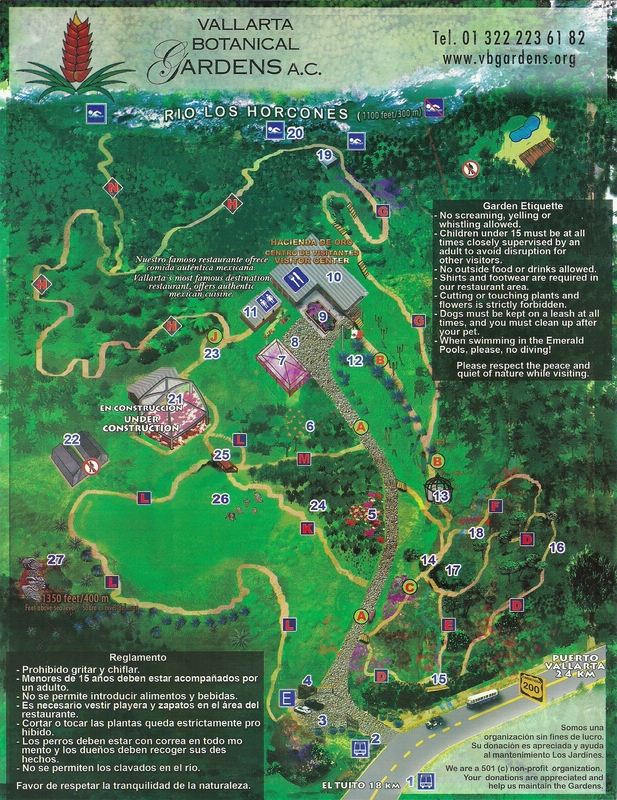 Map of the Botanical Gardens in Puerto Vallarta, Mexico. This map was uploaded with the permission of Robert Price, curator of the Botanical Gardens. Above is the front side side of the map of the Botanical Gardens. Below is the back side of the map. You can purchase a souvenir copy of this lovely map for only $5 pesos at the garden’s entrance point or at the counter of the gift store. 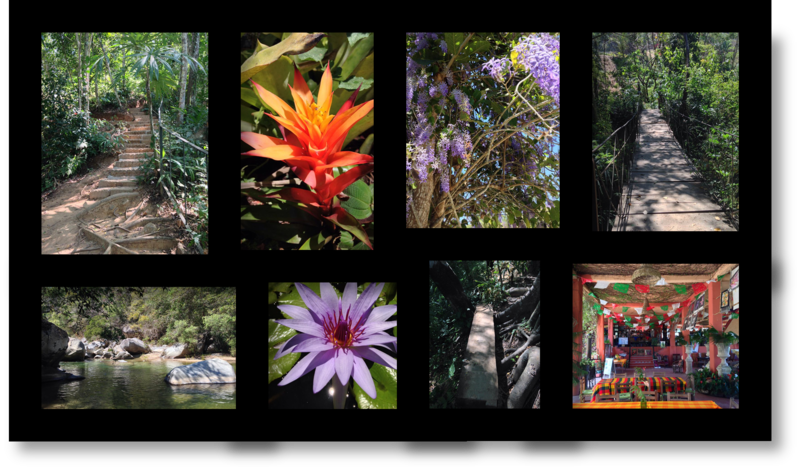 Below is an excerpt from the Vallarta Botanical Gardens website, as I prefer to leave it to the experts to best describe this beautiful garden paradise located in gorgeous Puerto Vallarta, Mexico. I hope you’ll schedule in a visit on your upcoming holiday. 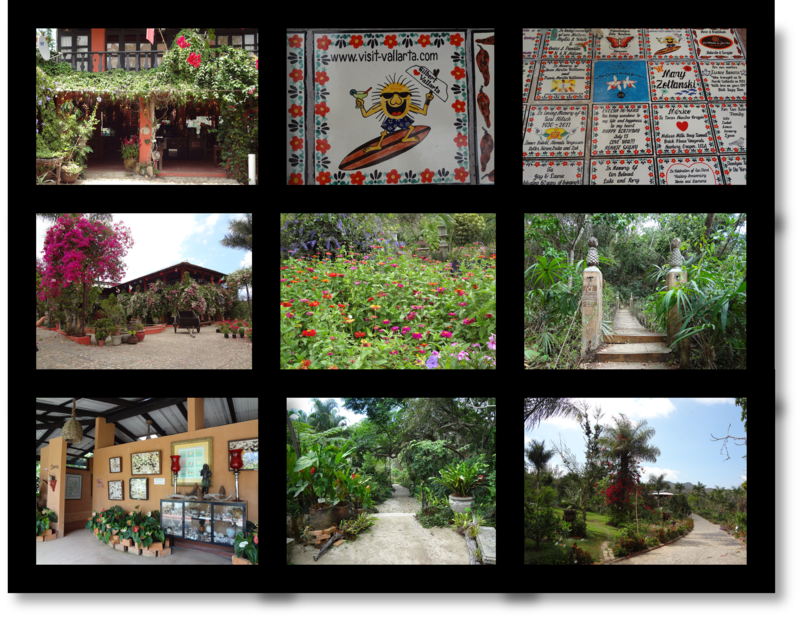 The Vallarta Botanical Gardens started in 2004 with a vision of building Mexico’s greatest botanical garden in the enchanted tropical highlands of Jalisco, Mexico. The twenty acres that are now the Gardens were ranch property, nearly half of which was overgrazed cattle pasture, the other half, old growth tropical deciduous forest. The first phase of construction was the Hacienda de Oro Visitor Center and Restaurant, the centerpiece structure of the Gardens. Next came the nurseries for plant propagation, trails throughout the property, a statuary making facility, and of course many plants. Over 6000 Blue Agaves (Agave tequilana) adorn our “Blue Agave Hills” while this area is being re-forested with native tropical hardwood trees. Over 1000 native tabebuia, mountain pine and mahogany trees have been planted in this former cattle grazing area, deforested over 30 years ago. Native oak species are being grown from acorns to establish our Mexican Oak Collection. Considering that Mexico is the world leader in oak diversity with over 160 different species, this is sure to become a prized feature of the Garden. 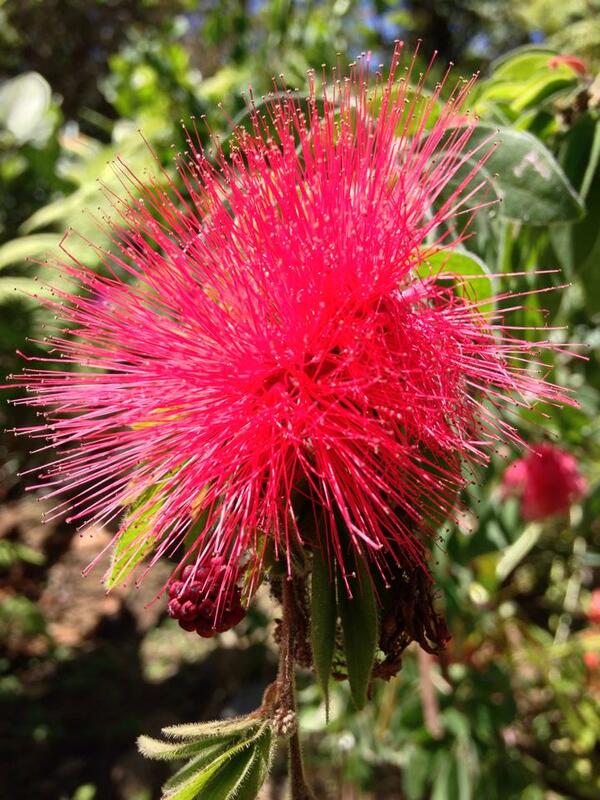 The Vallarta Botanical Gardens started a US based 501(c)(3) not for profit “Friends of the Vallarta Botanical Gardens A.C.” to allow us to accept tax deductible donations from individuals and foundations. Grants and generous donations have allowed us to improve our grounds and plant collections. One of the latest expansions that has added to the delight of our visitors is the Holstein Vanilla and Orchid Conservatory with a rotating array of exquisite orchids and other stunning flowering plants. The success of the Vallarta Botanical Gardens have allowed us to give back to our community in a variety of ways. We provide free admission to the Gardens to over 1,000 visiting school children each year. We have collaborated with Grassroots Natural Resource Conservation and indigenous knowledge proponents including the Maya Nut Institute and the Center For Traditional Medicine. We have participated in tropical plant research with the American Orchid Society and Sam Houston State University. Our conservation initiatives have been recognized by SEMARNAT (Secretaría de medio ambiente y recursos naturals), Mexico’s Agency of Environment and Natural Resources, which has registered our Garden as an UMA (Unidad de Manejo Para La Conservacion De Vida Silvestre), an official Wildlife Conservation Management Unit.